Wallace, March 18: Senator, is that helpful to Democrats in 2018 to have Hillary Clinton dismissing the 60 million-plus voters who supported and elected Donald Trump dismissed, some could even say condemned as racists and misogynists? Durbin: No, it’s not helpful at all. In fact, my friend Hillary Clinton is wrong. Thirty percent of the people who voted for Donald Trump had voted for President Obama. Why? The same people who look for change with President Obama thought there wasn’t enough as far as their personal lives were concerned, and they supported Donald Trump. That is a reality the Democrats acknowledge. That’s why we are focusing on issues to address this concern they have about the economic insecurity that many working families face. That 30 percent figure struck us as high, especially since Clinton won the popular vote by nearly 3 million votes but lost the Electoral College. Durbin’s Senate office did not respond when we repeatedly asked where the senator got his 30 percent figure (even though it did get back to us with information that showed the senator was right about another, unrelated claim). The available research in this area, however, shows that Durbin is wrong. In a report last year, George Washington University Associate Professor of Political Science John Sides found that 9.2 percent of voters who said they voted for Barack Obama in 2012 voted instead for Trump in 2016. His analysis was based on a survey of 7,156 respondents who said they had voted for a presidential candidate in 2012 and 2016. The survey was conducted by YouGov in December 2016. We asked Sides if he is familiar with any others who have done work in this area, and he referred us to UMass Amherst Political Science Professor Brian Schaffner, who is also the founding director of the UMass Poll. “Yes, that figure does indeed sound way too high,” Schaffner told us in an email, referring to Durbin’s 30 percent figure. Schaffner recently co-authored an op-ed in the New York Times in which he also said that about 9 percent of Obama voters in 2012 voted for Trump in 2016. In the Times op-ed, Schaffner and his colleagues urged the Democratic Party not to ignore the Obama voters who did not vote in 2016. “The Missing Obama Millions,” Schaffner et al, March 10: Our analysis shows that while 9 percent of Obama 2012 voters went for Mr. Trump in 2016, 7 percent — that’s more than four million missing voters — stayed home. Three percent voted for a third-party candidate. We would hardly urge Democratic strategists to abandon Obama-to-Trump voters. However, Obama-to-nonvoters are a relatively liberal segment of the country who have largely been ignored. Schaffner and his colleagues arrived at 9 percent based on an analysis of the 2016 Cooperative Congressional Election Study, which interviewed more than 64,000 respondents before and after the election. 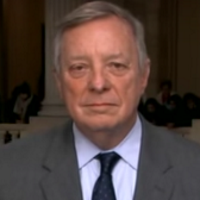 We don’t know what Durbin had in mind when he cited a much higher figure of crossover voters. But we couldn’t find any evidence for it, and his office provided us with none. "Thirty percent of the people who voted for Donald Trump had voted for President Obama."